WHEREAS, there are no revenue bond ordinances or other ordinances or resolutions of the municipality which require financial statements and financial reports to be prepared in conformity with K.S.A. 75-1120a(a) for the year ended 2018. NOW, THEREFORE BE IT RESOLVED BY THE GOVERNING BODY OF THE CITY OF GOODLAND, KANSAS in regular meeting duly assembled this 18th day of June, 2018 that the Governing Body waives the requirements of K.S.A. 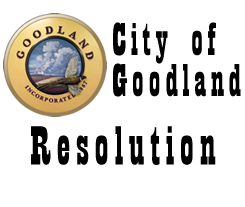 75-1120a(a) as they apply to the City of Goodland for the year ended 2018. PASSED AND ADOPTED this 18th day of June, 2018 by the Governing Body of the City of Goodland, Kansas.